In between light rain showers Michael and I visited Teresa’s garden. 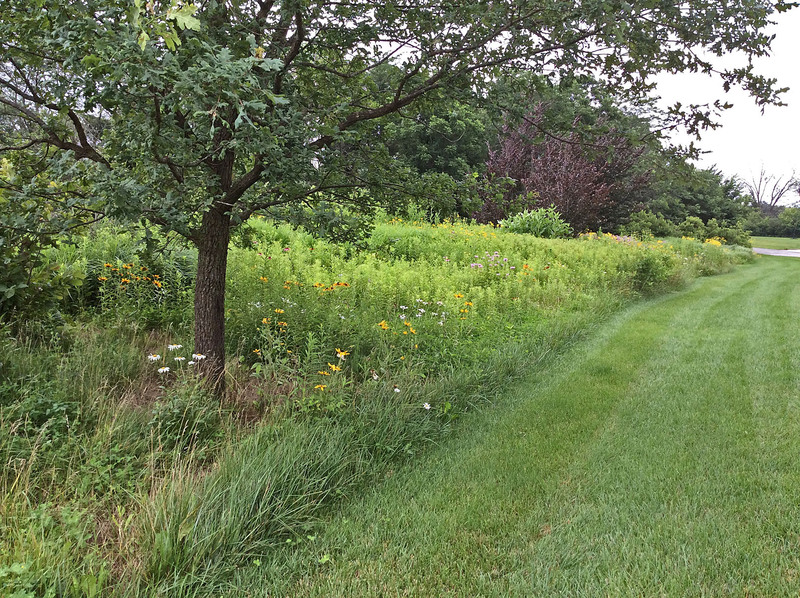 Nestled in a conservation area along the scenic Little Darby Creek, Teresa created a haven for wildlife and for herself and her family. Her design is a continuum: formal elements by the house; semi-formal beds further out, culminating in prairie areas by the road. Her gardens reflect not only the natural areas that were along the Little Darby before humans settled here, but also of the food and cutting gardens that came after. 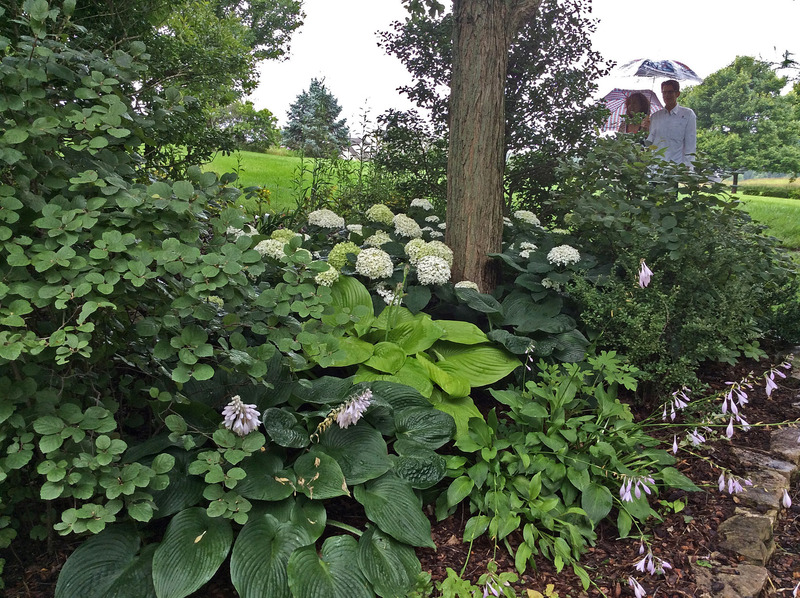 The Midwest is experiencing a record-setting amount of rain for June and July, so Teresa’s gardens are lush. The long prairie areas that line the road are full of bloom as we move into high summer color. 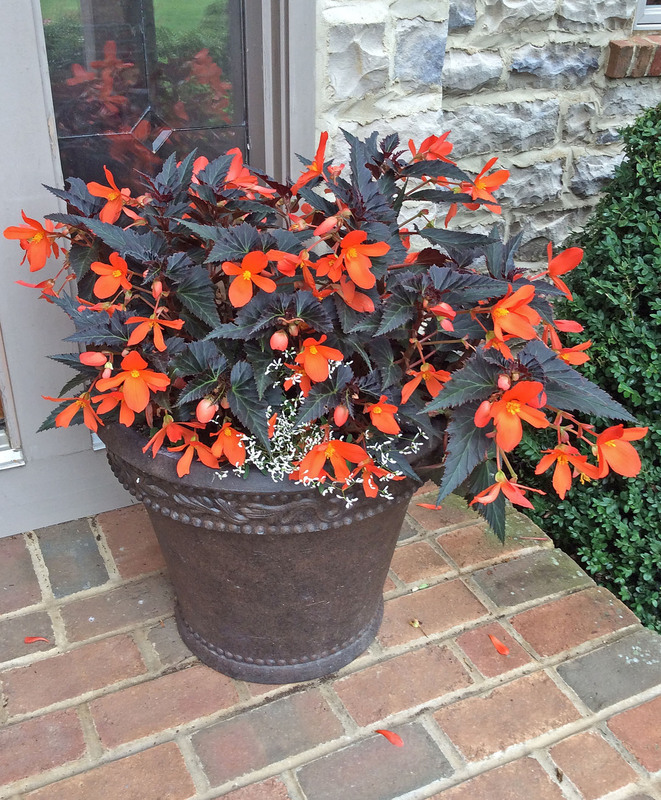 We are greeted at the front door by one of Teresa’s many colorful containers. Her gardens are lovely contrasts of textural foliage punctuated by well-placed blooming plants and artful placements of garden accents. 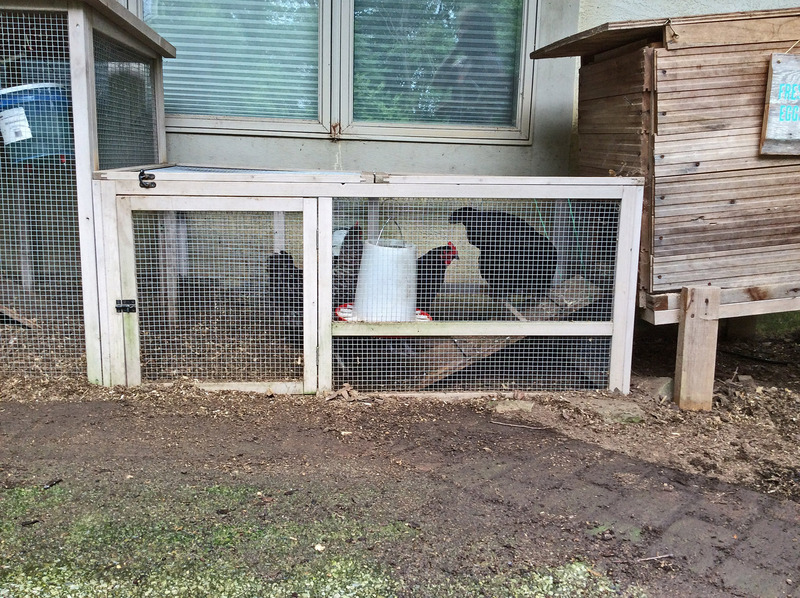 The vegetable-cutting garden is perfectly placed within easy access to Teresa’s workroom. 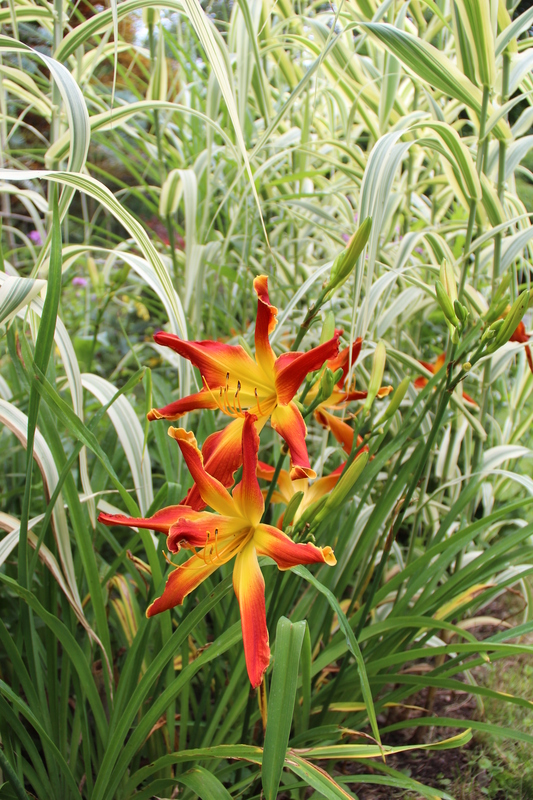 The mass of crocosmia that you see below provided the flowers for a simple arrangement in the kitchen. The garden itself is an interesting interpretation a four-square design. 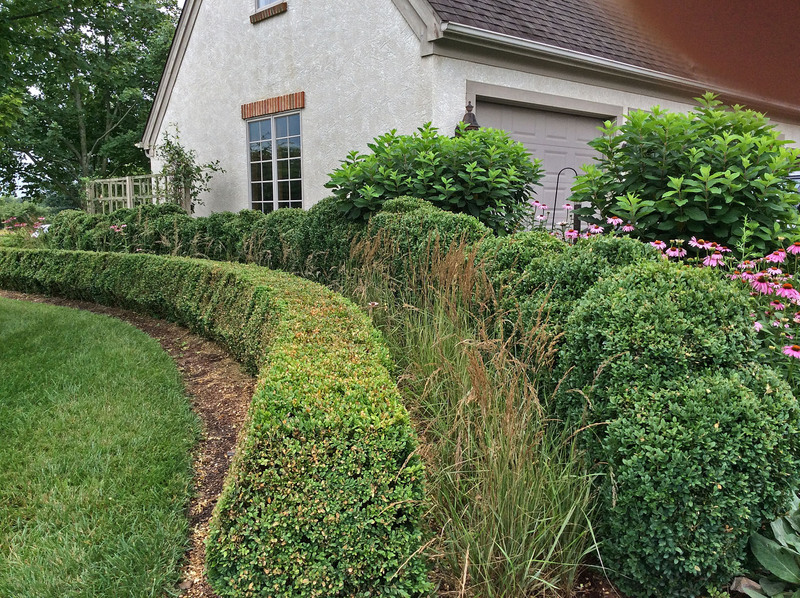 Instead of opting for the traditional, Teresa created a more modern zig-zag design. 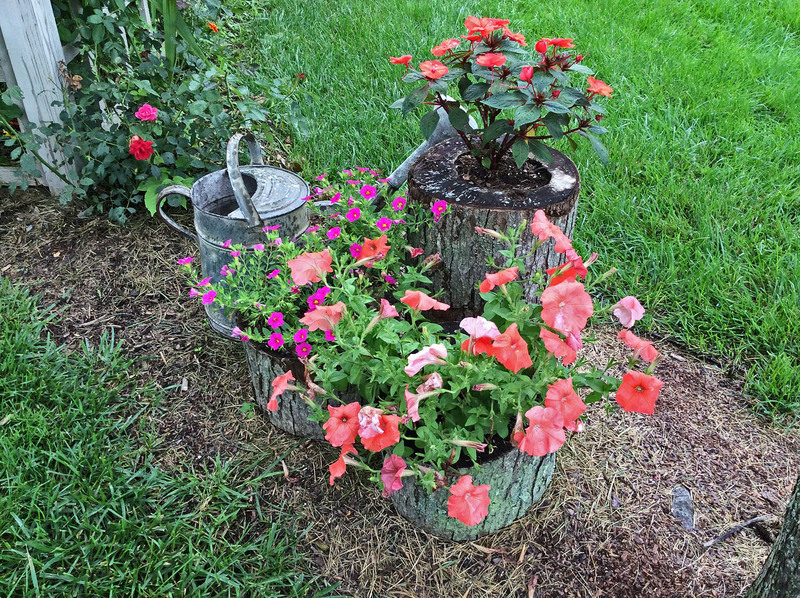 We can’t always control where our plants will roam. 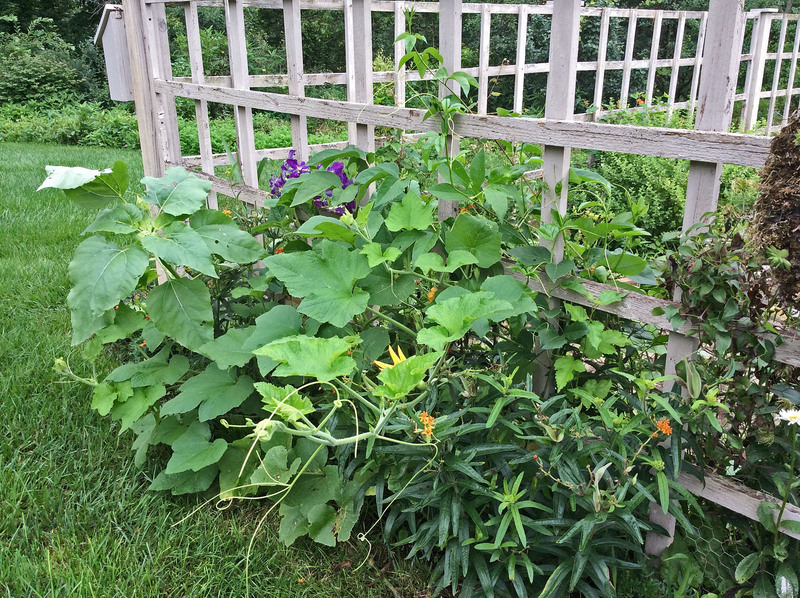 A volunteer pumpkin has escaped and entwined with butterflyweed. 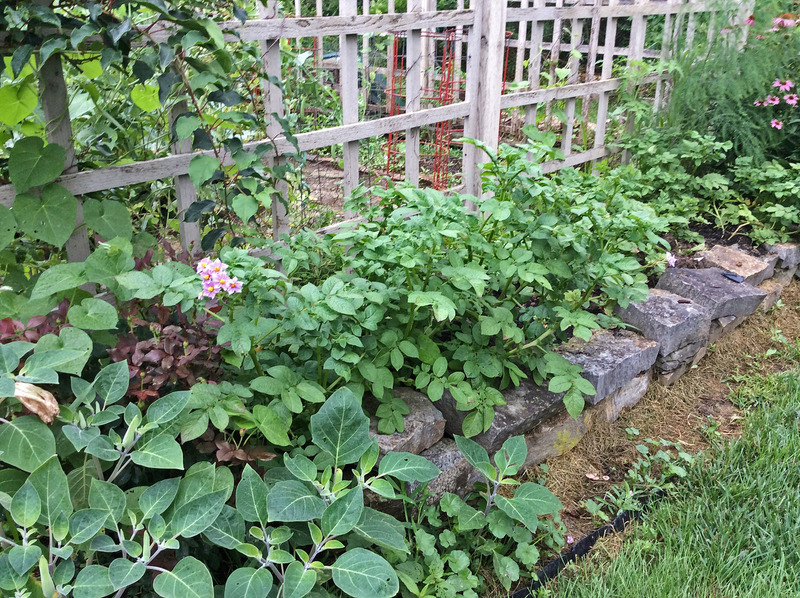 On the other side of the garden, Teresa purposely inter-planted potatoes with asparagus, purple coneflower and kiwi. The sacred Datura (right image; lower left) self-seeds as it will. 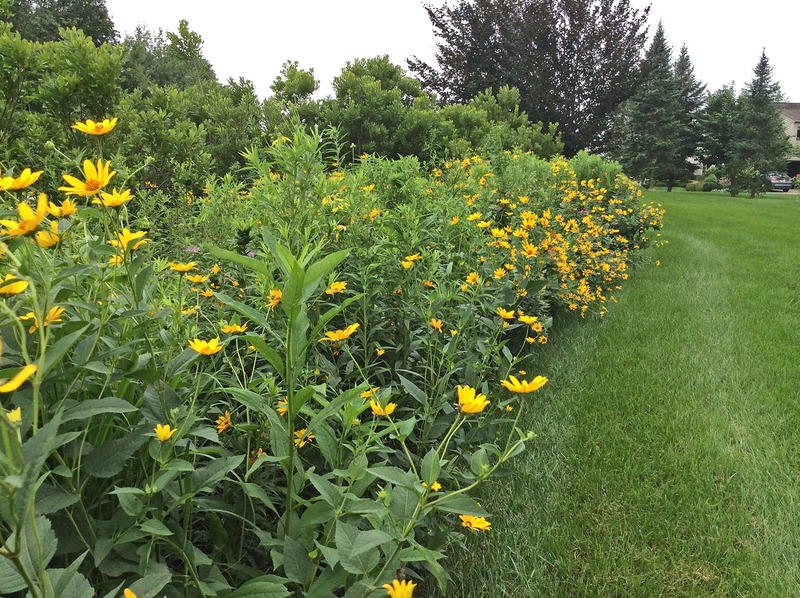 Onto the prairie – A personal favorite is false sunflower (Heliopsis sp.) which has spread along one portion of the prairie area. A close-up of another section reveals the intermingling of other prairie species. The patterns ebb and flow over the years depending on environmental conditions. Because of the rain, there were fewer pollinators present, but I have visited on a sunny day and the prairie was buzzing with a myriad of insects. 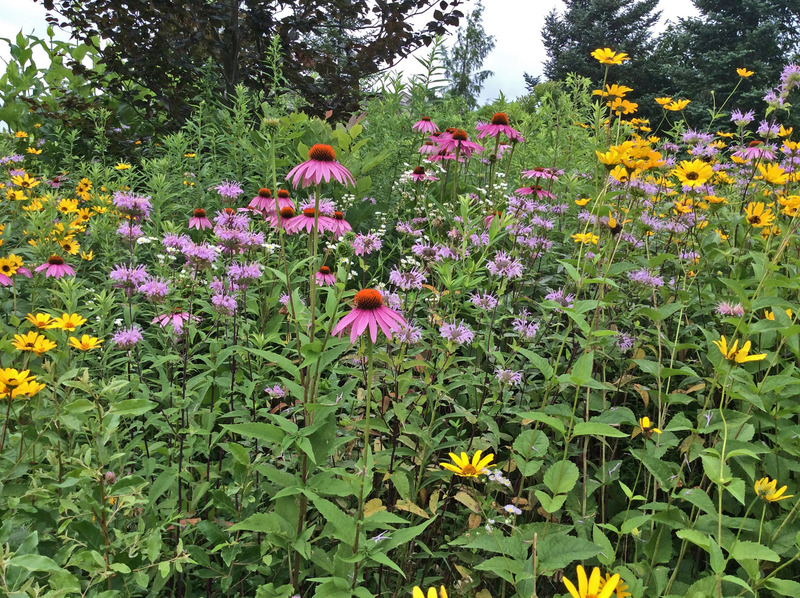 The goldfinches are already harvesting the purple coneflowers. Next stop: visiting Teresa’s woods. 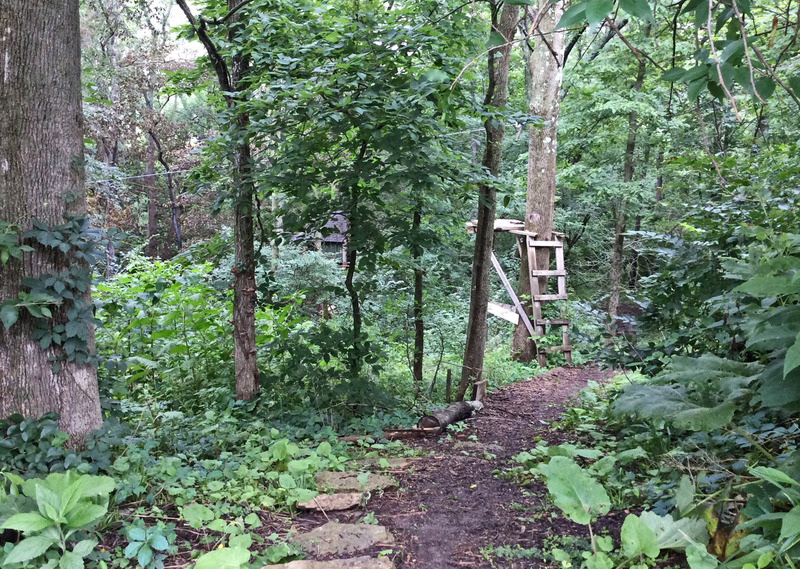 Her son Mark installed a zip line and built a small treehouse and has made this part of the yard his own. We decided not to venture into this natural area because the mosquitoes were – quite literally – out for our blood! It was easier to avoid them by staying out in the open, breezy areas. Just off the woods is the backyard terrace area where texture rules. In the lower area, we visited “the girls”. They often roam with Teresa as she works in the garden. I’m thinking how this might be a good addition to my own garden. Where else do you find an insecticide (insects are one of their favorite foods), a fertilizer, a tractor and a food provider wrapped up in one attractive package? Coming out of the backyard into a semi-formal woodland garden, the rain started again. Time to say goodbye, accept some beautiful eggs, go home and bake. Undaunted, Teresa negotiated Little Cola Road, a narrow road that was purported to be a two lane road on the last leg of our trip to Lily Fest 2015 near Logan in Ohio’s scenic Appalachia country. Fortunately, most cars were going to Lily Fest, so we had few passing encounters. When we left, we had many more passing encounters. I’m not fond of tiny cars, but I would have greatly appreciated being in a Smart car! After parking, we walked down the path with our guide Sheri Quick. Sheri not only led us to Lily Fest, but she introduced us to Bobbi Bishop. 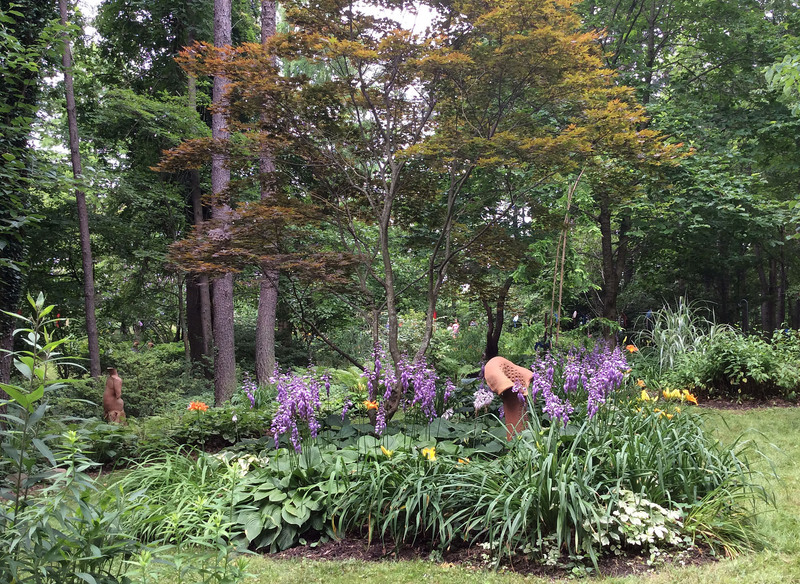 She and her late husband Bruce started Lily Fest in 1992 as a small event to show off their gardens. 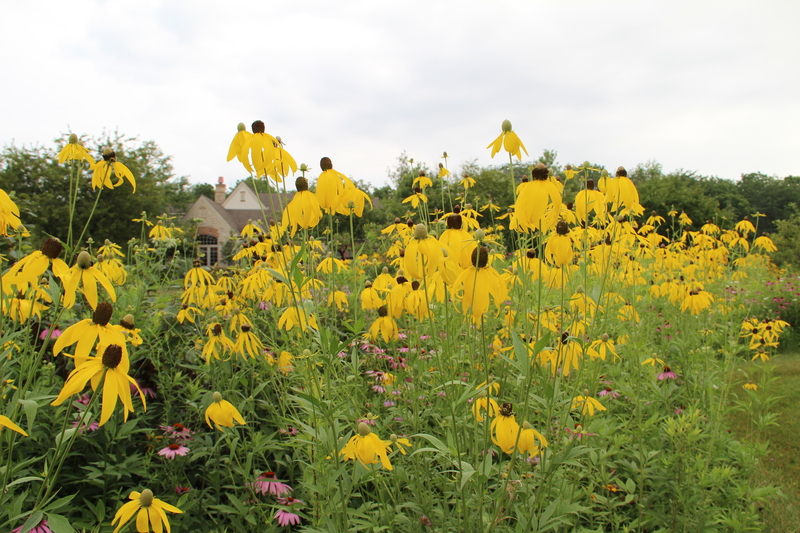 Bruce’s spirit still guides the festival, and his gardens are an inspiration to Midwest gardeners. So, what did I find exciting? The gardens are a tapestry of green punctuated by blooms and varied-colored leaves. 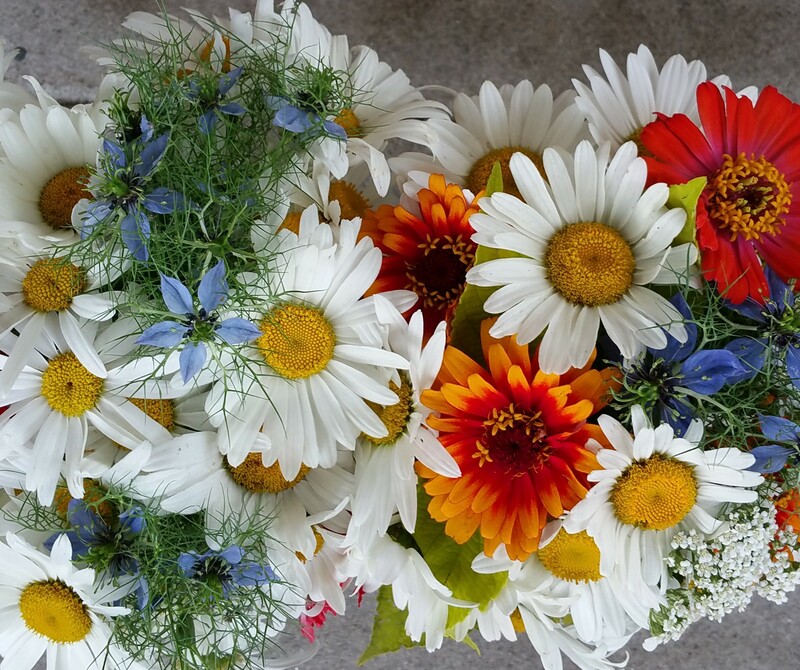 The bursts of color are balanced by the calming textural contrasts as evidenced below. The art! 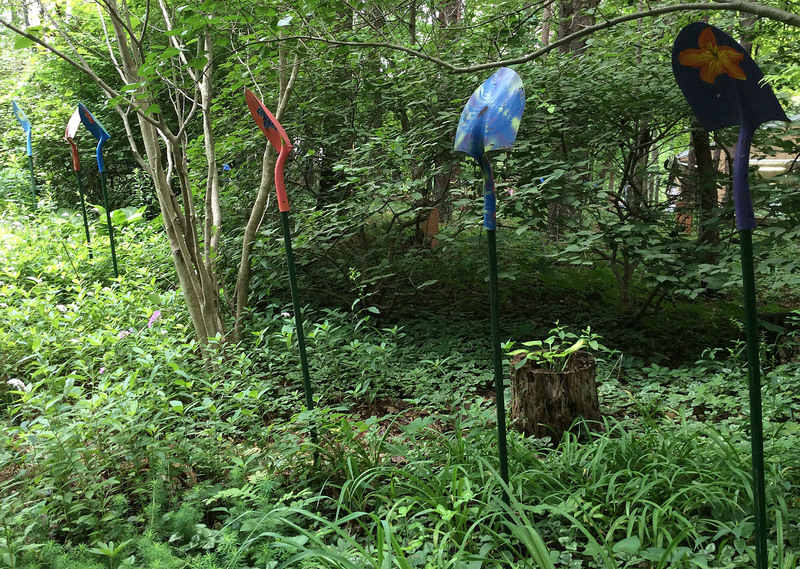 Artful pieces are scattered throughout the garden. Below is a simple composition of shovels upended in the garden and painted. It is a subtle installation. 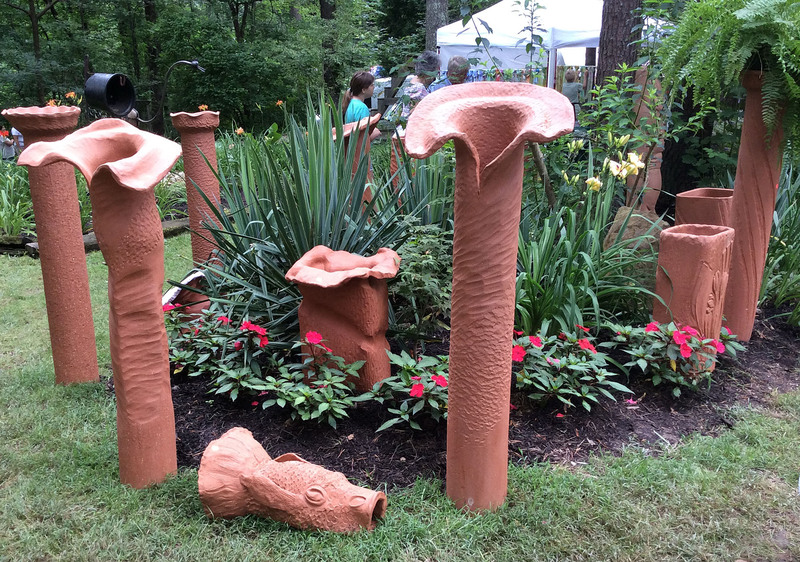 Many of the artists represented in the gardens were present in the booths that lined several pathways. 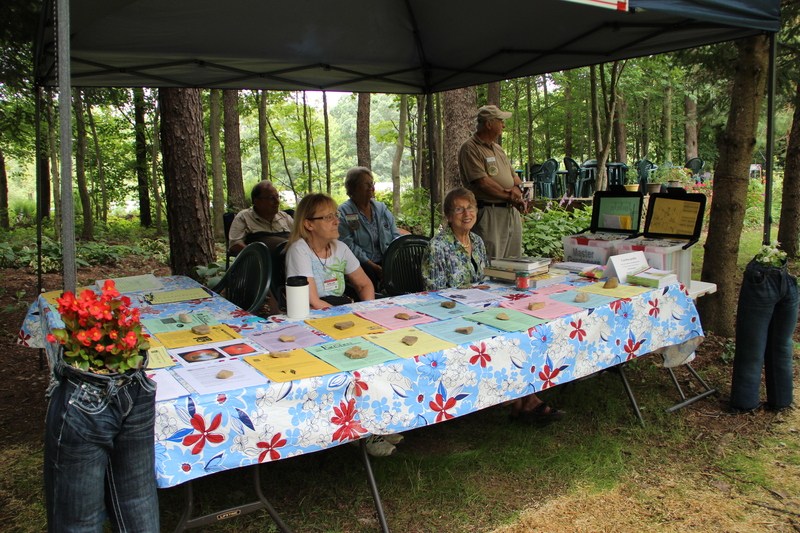 I recognized some crafts people from other shows, but was happy to discover new adornments and ideas for the garden. At the end of our visit, we passed one of the ponds. 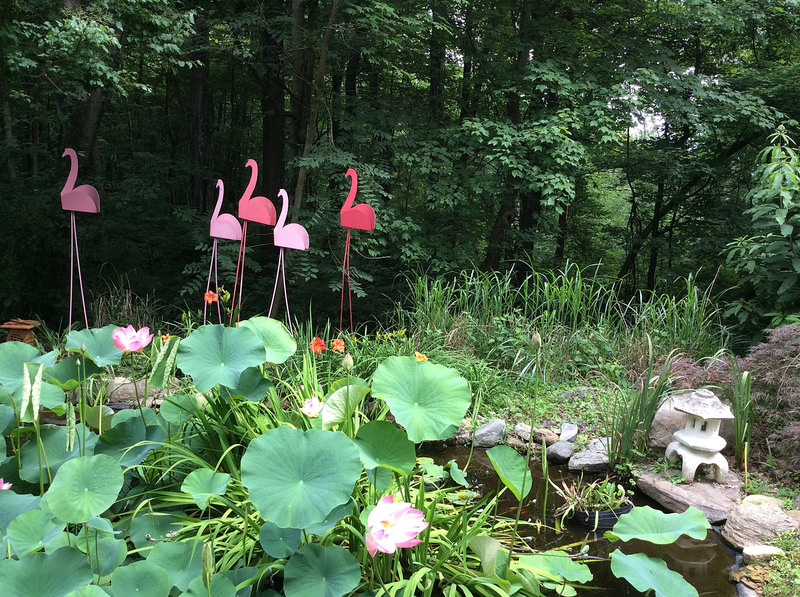 Visitors were sitting on benches and listening to the soulful flute music of Mark Thunderwalker Camden while viewing this rhapsody in pink: lotus, flamingos and a dusky Japanese maple. 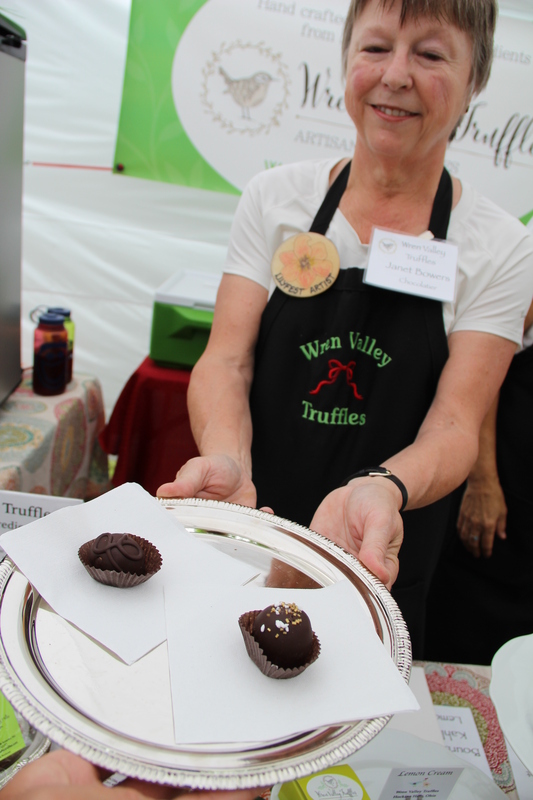 Oh, I did find some chocolate, which is a must at any festival. At Lily Fest, there’s a wonderful sense of community from the volunteers that helped us park cars to the greeters at the front gate to all the gardeners that volunteered for weeks prior to make the grounds so lovely. 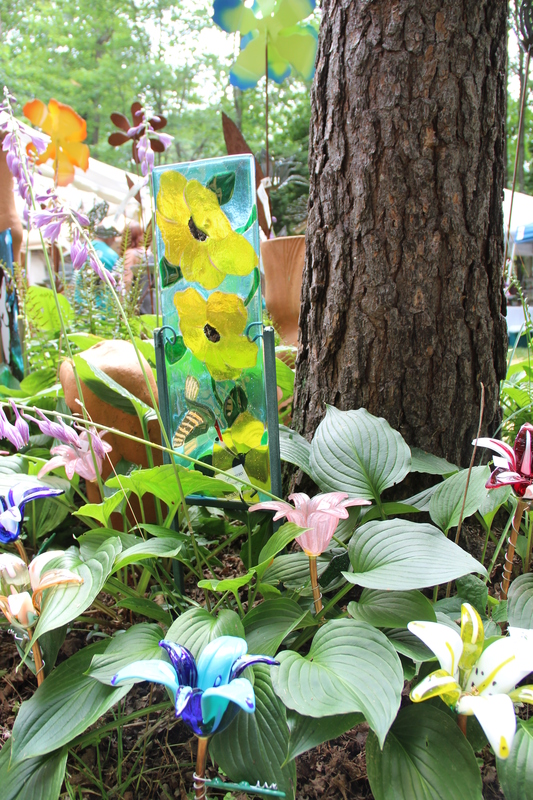 Like Deb, I also appreciated the selection of juried artists including many with lily-inspired pieces — lily glass sculptures, lily stone statues and lily ironwork. Lily Fest is also filled with plenty of garden whimsy from these kitschy garden pants to this charming cottage. And, of course, we came to see the lilies!